Nevium provides industry-leading expertise in the use of Internet and social media analytics to support valuation opinions and economic damages calculations. In an IP infringement and litigation context, Internet and social media analytical tools provide the data to support legal arguments and expert opinions related to trademark infringement, copyright infringement, false endorsement, false advertising, online defamation and other claims. Relief from Pay-Per-Click calculates the cost of Internet or social media advertising that would have been paid had paid search advertising been used rather than using the subject IP to drive organic search traffic. Today’s business attorneys and litigators need to understand the tools used to analyze website traffic and social media use and how the data can be leveraged to quantify economic damages and loss of value. The wealth of online advertising and commerce data has become essential for analyzing and investigating damages claims involving brands, celebrity name and likeness, copyrights and many other assets. For example, a business can use a brand name or celebrity name to benefit organic search results, resulting in additional traffic to its website. This business has essentially avoided the cost of search-based pay-per-click advertising and benefited from the additional website traffic. 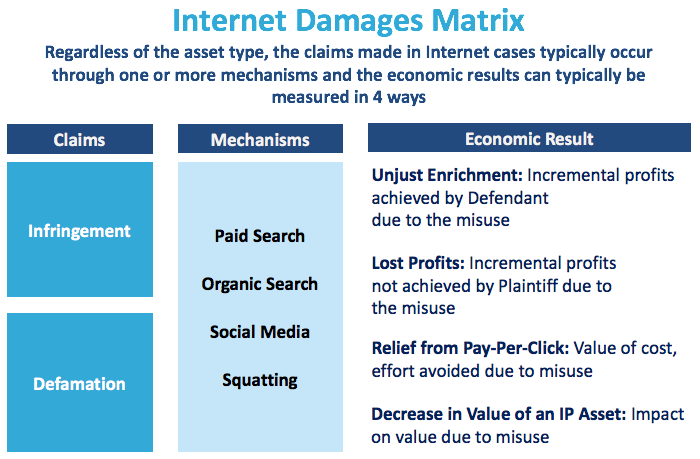 A relief from pay-per-click damages analysis can be used to quantify economic damages if it is determined that this use constitutes infringement. PPC prices are a key element in damages calculations and valuations using a relief from pay-per-click (RfPPC) methodology. RfPPC calculates the cost of Internet or social media advertising that would have been paid had paid search advertising been used rather than using the subject IP to drive organic search traffic. RfPPC is an analytical technique adopted to the growing use of Internet and social media marketing and is similar in concept to a relief from royalty calculation. In a Relief from Royalty calculation, value or damages are calculated assuming the IP user would have licensed the subject IP from the IP owner and paid the IP owner market-based compensation, typically in the form of royalty payments. In a Relief from Pay Per Click calculation, value or damage are calculated assuming the search term user would have paid for search traffic and click-throughs rather than use the subject search term to drive organic traffic and clicks. In both calculations, an observable market transaction is used a proxy for the cost of the actual activity. The RfPPC calculation has been used in litigation to quantify damages in claims involving trademark, copyright and right of publicity infringement; and in valuation assignments to quantify the impact of brand assets, value trademarks and copyrights and measure the impact of celebrity endorsements.